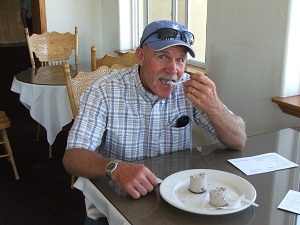 On July 23, 2011, from 11:00 am to 3:00 pm Neal and I (Debbie) enjoyed the third annual Alamosa Restaurant Walk. This was a very “filling” way to spend an afternoon while supporting a good cause, the local food banks. Each participant was given a score sheet to vote for their best dish. 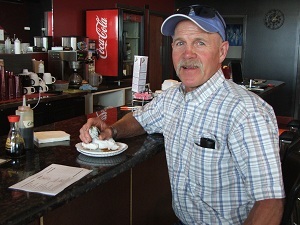 In addition to the restaurants participating, the San Luis Valley Museum offered free admission. Ten restaurants were involved in the restaurant walk. The cost was a $10.00 donation per person to participate. The proceeds from the day went directly to support the Food Bank Network of the San Luis Valley. The restaurants involved in the Alamosa Restaurant Walk included Quizno’s, Trujillo’s, Wild Ginger, Mrs. Rivera’s Kitchen, San Luis Valley Brewing Company, Milagros Coffee House, May-Wa, Fresh Tortilla Company, Bistro Rialto, and Alamosa Food Bank. Check in began at Milagros Coffee House, unless tickets were purchased in advance. We walked the whole time which gave us much needed exercise after sampling items at each restaurant but you could drive if you wished. I would suggest allowing at least two hours to fully enjoy the restaurant walk. We ran out of time near the end of the 3:00 p.m. timeline. We began at Quizno’s where they personally dished up a sample of their new Harvest Salad which included lettuce, chicken, craisens, tomato, sunflower seeds, cucumber, apple, grapes and a raspberry vinaigrette dressing. This was definitely one of our favorites. Next stop was at Trujillo’s which is one of our favorite places to eat. We were each given a chocolate cheese cake. Very good, extremely rich! The next stop was to the Alamosa Visitor’s Center. Although not on the Restaurant Walk, they gave us each a free ball cap for signing in their guest book and had cookies available. The fourth stop was at the Alamosa Food Bank. After the Food Bank, a short walk brought us to May-Wa’s on Main Street. We sampled a wonton, egg roll, and coconut cake. This was the first restaurant to offer water to drink which was appreciated. A short walk then took us to the Bistro Rialto where we tried calamari and fried vegetables with a cocktail sauce. Two blocks from there brought us to the Fresh Tortilla Company where we sampled a gooey butter cake. On their brochure which was given to us, it was a recipe brought over from Germany. We enjoyed what we considered a full meal at Mrs. Rivera’s Kitchen. This was definitely our most impressive restaurant. They welcomed us in, seated us and provided a full glass of water to drink. They then brought out a full plate with tortilla chips, salsa, a beef and bean burrito, quesadilla and a cheese enchilada after asking if we wanted red or green chili. If that wasn’t enough, we were then offered a choice of a sopapilla or a churro for dessert. This restaurant definitely wanted the restaurant walk participants to feel welcome and they certainly succeeded. We were very impressed! Since it was nearly 3:00 p.m. we hurried back to the Wild Ginger because we had never eaten there. We sampled veggie sushi which had no raw fish but was rice covering cucumbers, or asparagus, or avocado. It was very good. We viewed their menu and found they have a lot of good food choices there. We finished at the San Luis Brewery with an artichoke/spinach dip and bean dip with chips and pita bread. It was after 3:00 p.m. when we turned in our score sheet in front of Milagros Coffee House voting for the best dish. I learned that about 130 people were involved with the Alamosa Restaurant Walk which will certainly help the fourteen San Luis Valley Food Banks. One of the stops on the restaurant walk was the Alamosa Food Bank. There we learned that there are fourteen Food Banks in the San Luis Valley. The Food Banks have one paid director who facilitates all the Food Banks and all of the other people are volunteers. In 2010 the food banks gave food to approximately 28,000 people, of which 12,000 were children. They have food drives several times a year to help keep the shelves full. As we visited, the shelves had many staples such as flour, spaghetti noodles, tuna, rice, beans and canned goods. They receive day old pasties and bread from local grocery stores. There is a system they incorporate when providing food to the many people including a brief questionnaire and a way to make sure people are only receiving their proper allotment. The appetizer for the Alamosa Restaurant Walk was a bean, rice and basil pesto. The beans and rice came off of their shelves while the basil was grown in the Community Garden just a couple of blocks south of the Food Bank.